1 What Is A Celiac Plexus Block? 4 How Is A Celiac Plexus Block Performed? 5 What Should I Expect After? A celiac plexus block is a minimally-invasive and potentially very effective treatment that can help relieve nerve pain that many cancer patients experience. Patients may even be able to reduce their pain medication use by up to 90%. We cover how this procedure takes place as well as any risk factors you need to know. To start, it is not surprising that almost all cancer patients report that the pain is the most distressing aspect of their condition. Patients suffering from pancreatic cancer face the most severe and typically unremitting forms of pain. Treatment can be challenging for physicians, but it’s also painful and frustrating for patients. This type of pain can also be unresponsive to many types of treatment. One of the most effective treatments available for managing this pain, however, is the celiac plexus block. These celiac nerves are responsible for monitoring large and vital parts of the body. But, they can also transmit pain information through them. A celiac plexus block effectively treats this abdominal pain because it blocks nerves that transfer information to the spinal cord and brain. And this is where we process pain sensations. When performed by a highly-trained and specialized physician, this procedure can drastically improve an abdominal cancer patient’s quality of life. Previous studies have provided ample evidence to support the use of the celiac plexus block to relieve severe and refractory nerve pain. 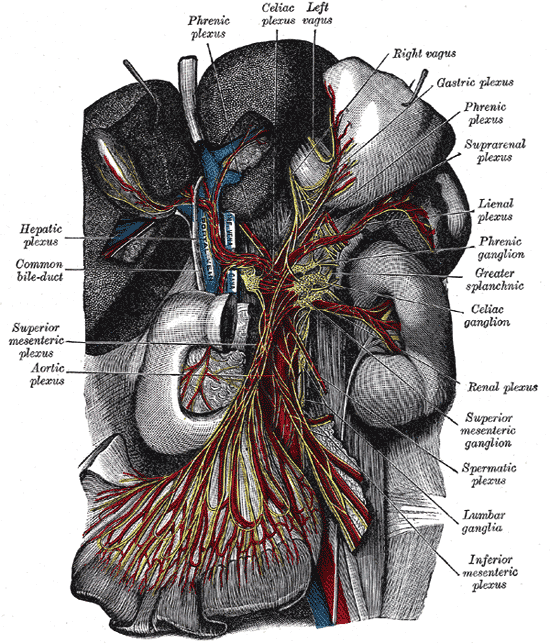 The celiac plexus block targets pain within the abdomen in particular. In particular, patients suffering from pancreatic cancer respond favorably to the procedure. Neurolytic celiac plexus blocks, however, are not as common. This procedure, though, is also reserved for the treatment of pain and discomfort associated with malignancies of the upper abdomen. In these cases, the most appropriate use are for patients who have undergone previous failed treatment trials. The procedure for a celiac plexus block can be done in several ways. The most commonly used method for performing a celiac plexus block starts with the patient lying down flat on their stomach. You can also request an intravenous sedation medication in order to make the procedure more comfortable. If you choose to do so, your vital signs will be monitored closely, including body temperature, pulse rate, and blood pressure. To start, the performing physician anaesthetizes the area using a topical anesthetic. This is applied to the surface of the skin in two different areas on the back. One area is the location where an X-ray device is inserted. This allows the physician to guide the injection needle to the proper location. The second area is where the injection needle itself is inserted. In some cases, the physician may use contrast dye in order to confirm correct placement of the injection needle. Once the physician is certain that the needle is in the correct position, the anesthetic is injected. For a neurolytic celiac plexus block, many physicians will also inject alcohol in addition to the anesthetic medication. The purpose of the alcohol is to destroy the tissue of the plexus nerves. As noted, these transmit pain information from the abdomen to the spinal cord and brain, thus temporarily impairing their function. In most cases, the celiac plexus block procedure takes less than 30 minutes to perform. Once the procedure is complete, the healthcare team transports patients to a recovery room where they are monitored for any adverse reactions. Patients can expect to spend anywhere from two to four hours in recovery before their physician discharges them. As for pain relief? It may be instantaneous or within the first day. A proportion of celiac plexus block patients will report an almost immediate reduction of pain, though many patients do not experience pain relief for six to 24 hours. If patients experience pain reduction, but still some of their symptoms, their pain specialist may recommend returning for more injections. This is because celiac plexus block injections are safe enough to be administered repeatedly. Thus, it is recommended that patients receive additional injections until they no longer report pain. Patients receiving celiac plexus block injections can expect to experience relief from even severe and refractory forms of pain. Neurolytic celiac plexus block patients generally report around two months of pain relief. Some common side effects reported along with this procedure include transient diarrhea and hypotension. Working a specialist who has advanced experience performing this procedure can help mitigate your risks. You should also look for one who uses fluoroscopic guidance for the injection. The celiac plexus block is a procedure used to treat severe and refractory forms of chronic pain in the abdominal region. The target of this treatment is to inhibit the function of the celiac ganglia, which is responsible for transmitting pain information from the peripheral nerves to the spinal cord and brain. The procedure is non-surgical and minimally invasive. It typically takes place on an outpatient basis. Even better, there are relatively few risks. Most patients report improvements in pain almost immediately–typically within 24 hours. Patients who do not achieve complete pain relief with the first injection may return for follow-up injections until they are completely pain free. Recovery from the procedure can take between two to four hours. Patients are also typically discharged the same day. If you’re suffering from severe abdominal pain, it’s time to speak with a doctor about the risks and benefits of a celiac plexus block for managing your pain. This procedure can help you reduce reliance on narcotic pain medications as well as help you get back to your life. To find a pain specialist near you, click the button below.